Home Cumann Óige Croí Éanna Young Gaels tackle bullying!! 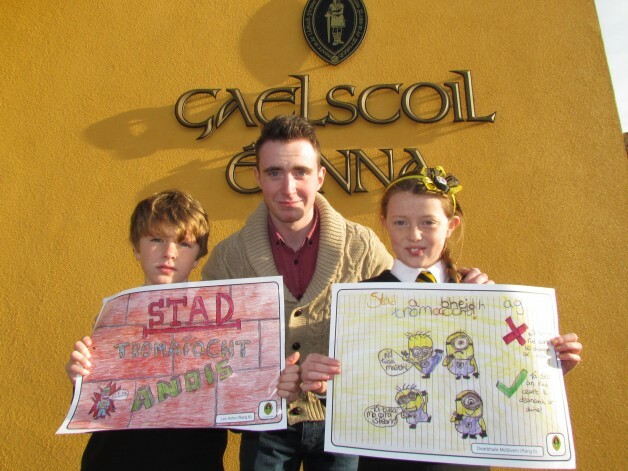 Last week was Anti Bullying week and to highlight this important issue Young People took part in an Anti Bullying Poster Competition through Glengormley’s Cumann Óige Chroí Éanna – the Irish Language Youth Club associated with Ireland’s fastest growing Gaelscoil – Gaelscoil Éanna. The poster competition was as a result of the work of the NI Youth Forum’s, Big Lottery Funded, ‘Champions 4 Change’ project. Champions 4 Change engages with NEET and at risk young people aged 16 – 24 and aims to inspire and motivate them to effect positive change in their own lives; with their peers; in their community and in society. A group of Glengormely teenagers used this opportunity to roll out an anti-bullying poster competition with pupils from the local Irish Language primary school. The winners received gift vouchers and their posters were printed and circulated to all of the other Irish Medium Schools in the NEELB and BELB areas. Pictured is Champions 4 Change participant Ciarán Doran, with joint winners of the competition Dearbhile McGivern (Rang 6); and Leo Ashe (Rang 6).